One of Thailand’s most respected young monks, Phra Maha Wuthichai Vajiramedhi, released his 9 wishes for 2009 on January 5th to The Daily Express in Thailand. Although a little political it’s understandable considering all the problems Thailand has faced politically the past 2 years. An excellent list and I truly hope his wishes come true. After reading his wishes I thought about it for a while and decided to make my own wish list for Thailand in this new year. While I’m not a revered monk I think many will agree that these wishes should come true as well. 1. May all sexual predators, especially pedophiles, stay away from Thailand. 2. May Thailand visa rules lighten up for those living in Thailand or wishing to live in Thailand or for that matter just wanting to extend a vacation stay in Thailand. 3. May the leaders of Thailand realize they need to resolve the problem they have in the south with the Islamists once and for all. 4. May all pedestrians crossing streets anywhere in Thailand make it safely to the other side…and back again if necessary. 5. May all the travelers to Thailand find the joy of sticky rice. 6. 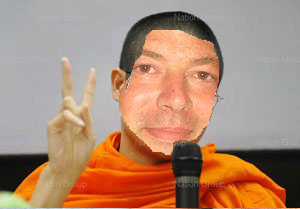 May Thai Air re-institute their JFK to BKK route…I know it’s selfish of me but like I said I’m not a monk. 7. May all expats and tourists who decide to drive cars or mororcycles in Thailand have a safe journey. 8. May all male tourists to the kingdom have a brief moment of clarity before they pop a handful of viagra after drinking all night and realize it can make you stiff in more ways than one. 9. May all those who love Thailand have their Thailand dreams come true. What are your wishes for 2009? No disrespect was meant to Phra Maha Wuthichai Vajiramedhi or any any monk world wide. I just wanted to show off my photoshopping prowess…ok you can stop laughing now! Having just received the blessings of a very auspicious local monk at the house blessing I have just attended I feel you can be forgiven! Funnily enough, although I am Christian, my little prayer this morning included some of the things on your list plus a rise in the exchange rate for GBP! 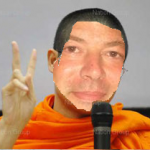 Mikes last blog post..Superstition and Religion in Thailand. I wish I was on my holiday in BKK now I love BKK! Put another way, could you spend a little less on Bangkok and a little bit more on the country roads. If that wish were to come true you can bet there would probably be a police officer every 100 yards down the roads you drive looking to raise the money needed through tickets. I have worked in Ayuthyya and lived in Bangkok before but I never heard about item 5: “joy sticky rice”. May I know what that is? Windmills last blog post..How fare the Muslims today? Not “Joy sticky rice” but the joy of sticky rice. You had to have had sticky rice in that time you lived there. It’s rice that is really sticky. It would have helped if I put “of” in there too…sorry bout that.